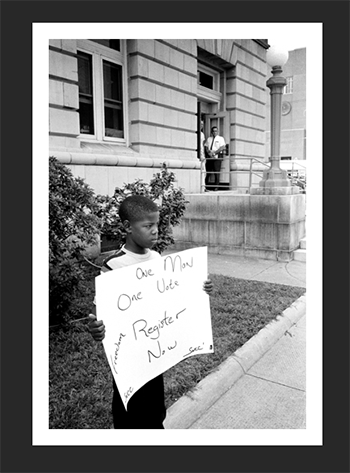 One of those exhibitions, I'm Walkin' For my Freedom: The Selma March for Voting Rights, featured historical photographs from renowned photojournalist Matt Herron, documenting a significant moment in the Civil Rights movement in Alabama that led directly to the Voting Rights Act of 1965. Herron covered the Civil Rights struggle for the top magazines of the era--including Life, Look, Time and Newsweek, and he won the World Press Photo Contest for civil rights photography in 1965. Delaveaga Elementary School teacher Antonio Romero noted the importance of teaching students about voting rights in the United States. Shelby Graham, director of the Mary Porter Sesnon Gallery, led interactive discussions with groups of students about the photographs on display. She pointed to one particular photo—depicting a lone child protester holding up a sign. 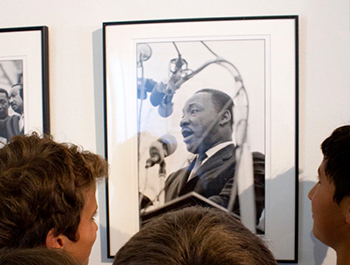 “Many students found that to be their favorite photo in the exhibit,” said Graham. “They saw an 8-year-old child--just a few years younger than they are--who was willing to risk getting arrested by holding up a ‘register to vote’ sign,” said Graham. Romero noted that his students had very strong opinions about the candidates in the 2016 presidential election. In fact, just three years ago, the Supreme Court invalidated the core of the Voting Rights Act of 1965--freeing nine states to change their election laws without advance federal approval--on the grounds that times had changed and this protection was no longer necessary. But recent lawsuits and revelations the past few months about voter suppression efforts have shown that racial discrimination still persists in 2016. 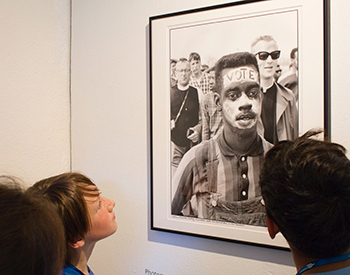 I'm Walkin' For my Freedom: The Selma March for Voting Rights will be on exhibition at the Porter Faculty Gallery through November 23. The Sesnon Gallery is also presenting Black (W)hole, an immersive exhibition designed by The Einstein Collective combining the arts, data visualization and astrophysics--also running through November 23. Admission to both exhibitions is free and open to the public. For more information, visit the Sesnon Gallery web site.